This information is taken from The Three Muleteers blog page and we think it’s rather good. First of all I must put my advice in context, I am no ‘expert’; I am not a behaviourist and I don’t make a living riding or training. The experience that I share is from my own time spent with mules both professionally and personally. As you’ll see I am the proud owner of two beautiful mules who have taught me so much. One came with very challenging behavioural issues and the other had a good start and we needed to refine our relationship as she developed. I have had the great fortune of meeting mule, donkey and horse owners from all around the world and hope that I can pass on some of what I have learnt from these many wise folks. Training always brings to mind lessons and sessions to teach another to achieve a goal… with mules my own view is that every minute that you spend around your mule is ‘training’. Whether you are moving your mule around the yard, feeding him, catching him or just shooting the breeze with him, you are training the mule and… your mule is no doubt training you! Before we start you need to understand that mules are super intelligent, they will question everything you ask them to do, you must be prepared to see this as their natural behaviour and not something that you will change. Working with mules is a bit like working with a child genius, expect lots of ‘whys’ and some tantrums but the results in the long term will be magnificent! This is essential for handler and mule! Until you know your mule really well I would always suggest you work wearing a hard hat and gloves, when training mules you have to expect behaviour occasionally to be extreme. As I’ve said before mules tend to kick as their first line of defence and will kick forwards and sideways as well as backwards, a hard hat may save your life so until you’re comfortable around your mule it’s definitely a good investment. If you feel relaxed and safe around your mule this will be communicated to him and give him comfort too. Mules are very quick learners, they have been scientifically proven to out perform both their horse and donkey parents in problem solving tests. However… mules will do things in their own sweet time and will not be rushed in to being ‘trained’. Mules tend to mature more slowly than other equines in my experience so expect plenty of juvenile delinquency if you’re working with a baby mule. Patience is essential with mules, if you lose it you will end up ten steps further back than where you started. Nothing will test your humour more than both your mule and others’ opinions of your mule. The best answer when faced with a training issue? Laugh! I am convinced that mules have a sense of humour, just when you think you’ve trained your mule to tie up or trot without bucking or lift it’s feet without swishing you in the face they will remind you that they are merely doing your bidding most of the time but do have a mind of their own. I think most folks that have mules appreciate their independent thoughts and learn to embrace them not try change them. If at first you don’t succeed definitely try again… just think of another way to explain what you want. Mules like to do things that are to their advantage, positive reinforcement works well with long ears. Whatever you can do to make training fun will definitely help you get to your desired outcome much more quickly. Neither of my mules like traditional ‘schooling’, they don’t see the point in it (and for that matter neither to I!) and they get bored quickly if you try to make them learn by repetition. I tend to ‘school’ for things when we’re out and about whether it be walking in hand or riding, it’s much easier to teach steering when you have obstacles to move around and when the mule can see the point to what it’s being asked. Mules are very intelligent and need to be kept amused, a bored mule can be extremely sour and destructive. They enjoy the company of mules or horses and like to have routine but with lots of variety thrown in too, the more interesting things happen in the day the happier they’re likely to be. The following are some general training tips. I’ll try to add specifics as time goes on.. If you are lucky enough to have a mule foal… I am very envious… it is a great opportunity to start as you mean to go on. Mule foals are very precocious and this can be a real advantage. ‘Training’ should start from birth, mules are often wary of people because they have not been handled early enough, by the time someone has started training them for riding they have often formed an opinion of humans that they are about bad things like foot trimming, needles and weaning! Touch and spend time with a mule foal as much as you can, pick up feet, get them used to their mouth being looked at, teach them to lead and desensitise them to as much as you possibly can. It is so much easier to do this with a foal than with a fully grown mule. Don’t over humanise the foal though, encouraging foals to nip or climb all over people is a recipe for disaster, be workmanlike with your foal as well as providing scratches and love. This is more important than it is with horse or donkey foals and will save you much time in the future or at least gain you a more saleable youngster. A word on mule foals, choose a suitable horse or pony mare; to breed a nice mule you need a mare with a calm disposition, mules from mares with bad temperaments are a nightmare, they take the worst of the mare and multiply it! Desensitise your mule to everything you can think of in a safe environment so that when you need him to be calm when things are not so controlled he knows that everything’s fine. This is where training really does mean everything you do with your mule. I constantly touch all of my equines all over, I randomly scratch tails, touch ears, stroke bellies, lift up lips and pat bottoms. This a great habit to get in to as it helps your mule to be comfortable with being handled all over, useful when a vet visit is required or when you accidentally brush your mule’s rump with your foot while mounting. Brooms, plastic bags, tarps, bonfires, dogs, cars, tractors, banging around, loud music etc.. are all everyday things that my mules are made to deal with, I don’t baby them unless they are scared in which case it’s my job to explain to them why they shouldn’t be scared. It’s really important to realise that mules have different ways of expressing themselves to horses. Mules take much of their behaviour from their donkey father, to really understand a mule it’s good to have experience of both parents. The Ears – the obvious bit, mules ears are very expressive! It’s pretty obvious when a mule is angry as the ears will lay straight back. A relaxed happy mule may have floppy ears, there is nothing better than wandering along on your relaxed mule with their ears flopping to the rhythm of their feet. Attentive ears are also common, take note when riding, those ears will point out lots of interesting things that otherwise you’d miss, I call them ear radar. The ears will also tell you if your mule is paying attention to you. The Tail – mules normally make excellent use of their tail. If it’s swishing your mule is either thinking or warning you that things are not as they should be. My mule Dragon warns me when she’s ‘tolerating’ things like being girthed up by swishing at me. Mules are quite capable of using their tails as a weapon! Dragon will swish deliberately at any object which is annoying her (me, the cat, a dog, the fence…), this is a very preliminary warning shot and should not be ignored, next there may be hooves involved! Mules will also swish when contemplating something, it is again a sign that they need time to figure something out (like the monster in the bush or the dog barking in the gateway). Freezing – those folks that are uneducated in the ways of mules will mistake a mule freezing to the spot as stubbornness. Freezing comes from the donkey side of the family and is infinitely preferable to the horse reaction to something that scares it – running away. Mules will generally spend time checking things out and will not easily be made to do something that they perceive as dangerous. Mules may also run in fear, mules rarely waste too much energy on this though, mine will pull up at the nearest snack stop, a mule will also run sensibly and will think rather than act in blind panic as would many horses. Pressure – mules tend to go in to pressure unless they have been trained to go away from it. Often when you start training you will find that your mule will lean in to the leg or hand rather than move away as you might expect. This is completely normal, you just need to train for the opposite behaviour! So often we label mule behaviour as naughty or stubborn. How many times have you said the mule’s naughty because it’s bucking, kicking or biting? Behaviour is simply a response to an issue in the mule’s life and in almost all cases what your mule is exhibiting is normal behaviour for its species. It’s up to you to work out why the mule is displaying this undesirable (to you) behaviour. If the mule is bucking it’s in response to a problem in the past or a problem now. Does your tack fit? Have you trained your mule properly and explained to him what is expected? Is it ‘easier’ for your mule to ditch you than to let you ride him badly, cause him pain or when he’s not physically capable of what you’re asking of him? If your mule kicks when you try to pick out his feet it’s probably because it’s never been explained to him that it’s safe for him and that it brings good consequences (see positive reinforcement). He is merely expressing his reluctance to trust a strange human creature with his precious foot, without this foot he will undoubtedly die. If a stranger yanked your leg up and tried to attack it with a drill would you stand still and let them do it?? No…. guess not. If your best friend explained nicely over a coffee that they wanted to give you a free of charge pedicure and foot massage with chocolate at each stage I’m guessing you’d say yes?! This is perhaps the most important piece of advice I can give you about mules. A good mule will be more like a good dog to you than a horse. I am utterly convinced that mules ‘know’ people that love them and those that don’t! Mules tend to bond very strongly to their chosen humans and once both sides are in love there’s little that they won’t do for each other. Spend time with your mule just hanging out together, scratch you mule, groom, walk together and have time to ‘do nothing’. If you really want your mule to respect and work with you it’s important to be a significant part of it’s life. Seeing him once a week and then asking him to trust you enough to keep him safe from monsters in the hedge is probably not enough until your relationship is solid! Being in love does not mean being walked all over though, mules like boundaries so make sure you set them. Think about what you’re going to do before you start. There are many good articles and books about ‘Shaping Behaviour’ which I would recommend you read. In essence it means that you should break a task down in to manageable steps and progress through each stage carefully and with time and patience. For example if you’re picking up a back foot to trim it you don’t want to go diving in straight to a nervous mule’s hind fetlock. You might have to start by simply getting the mule to stand still comfortably, then you’ll want to ensure you can safely touch the mule’s body working your way to the rump and very slowly down the hind leg before even thinking about going near the hoof with tools. Each step may take minutes or days but you must make sure that the mule is happy with each. If you encounter a problem go back to the previous step and start again and build up slowly. This is very true for mules! Mules like to challenge a problem and just when you think you’ve solved an issue they may throw it back at you even worse than you started with. This is normal behaviour and you shouldn’t worry. This is often the last ditch attempt by the mule to test its boundaries. Once they realise that this behaviour is not to their advantage they’ll cease to try. Mules have an innate sense of justice. If what you are asking of them is not fair or dangerous in their view then you are likely to encounter a big issue. If you are reprimanding your mule and using negative reinforcement (this should never be your default attitude) then beware. Never get in to an argument that you cannot win with positivity or when it is not safe to do so. There are occasions where Dragon and I have ‘disagreements’ about the correct direction or way of doing things, I have learnt that you must be careful about the arguments you pick and how you handle them. Never allow a disagreement to escalate too far because if you lose your mule’s respect or trust by making it behave (the mule is behaving this way because you are in its life and arguing with it remember) in a certain way like bucking or rearing you may never regain trust and control. Many a lovely mule has been spoilt by a bad tempered, impatient person who thought their mule should do something because they told it to! Mules do great with positive reinforcement. Whatever method of training you choose make sure it is based on positive reinforcement principles. Whether you are training using clicker methods, natural horsemanship or your own way of doing things make sure you give the mule the easy, fun and satisfying option to do the right thing. Most mules are eager to please their owners and will happily work with you if you are clear and considered in how you ask a question. Many will tell you your mule should do something because you “tell it to” but they’re wrong. Your mule should do something because it wants to. To achieve your goals give yourself the best chance of success by allowing your mule to live a natural, fulfilled and calm life. Mules need the company of other equines; preferably other mules or horses. They are herd animals and in my view it is not fair to keep them on their own. They need time to just be mules without fuss and attention from humans. It will make them all the more happy to work with you when you ask. Make sure that your mule is getting the right kind of diet. Many ‘behavioural issues’ are caused by overfeeding of inappropriate diets. Mules do really well on forage only (mine both thrive on a diet of mainly straw supplemented with hay / grass as required with a vitamin and mineral supplement), they do not need grain, commercial feeds or supplements unless they are working very hard or have health issues. Feeding grain to a mule is like giving kids access to the entire sweet shop and then expecting them to sit quietly for two hours! If things aren’t going right never be ashamed to ask for help. A trained eye and experienced advice can be invaluable. Please choose your trainer carefully though. Just because someone can train a horse does not mean that they can train a mule. Your trainer must be smart and patient and most importantly be interested and happy working with mules. 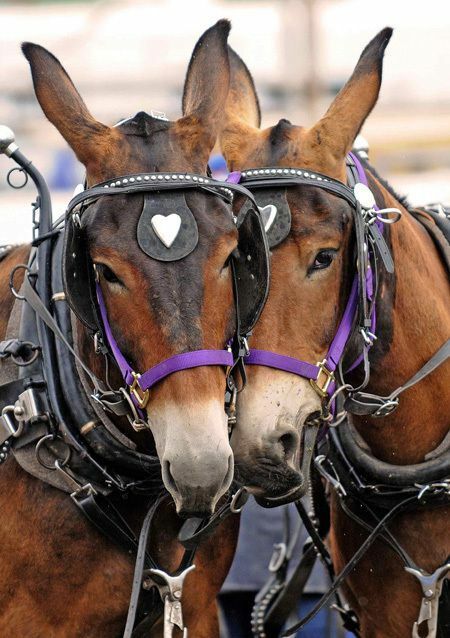 Your mule will spot a ‘pretender’ at a million paces! Some of the best mule trainers are those gentle folks that say nothing but communicate with equines on their own level. Natural horsemanship methods certainly work more effectively with mules than traditional methods but don’t think that these are a panacea. Find your own way of doing things and don’t be ashamed to admit when something isn’t working and try a different way of doing things. Listen to the feedback that your mule will undoubtedly be giving you and you won’t go far wrong. Mules are intelligent, wonderful animals but I’m the first person to admit that they’re not for everyone. If you want a challenge and partnership to last a lifetime then mules might just be for you. If you want an animal that you can get on to and immediately ride for miles without a problem and without having to put much time in to then get a horse! Horses are much less complex and more forgiving than mules and for many people this is what they want. I have to admit I love having my little pony to remind me that not all equines are geniuses who are constantly going to challenge the world around them. Guess it’s ‘horses for courses’ as they say but in this household mules rule!